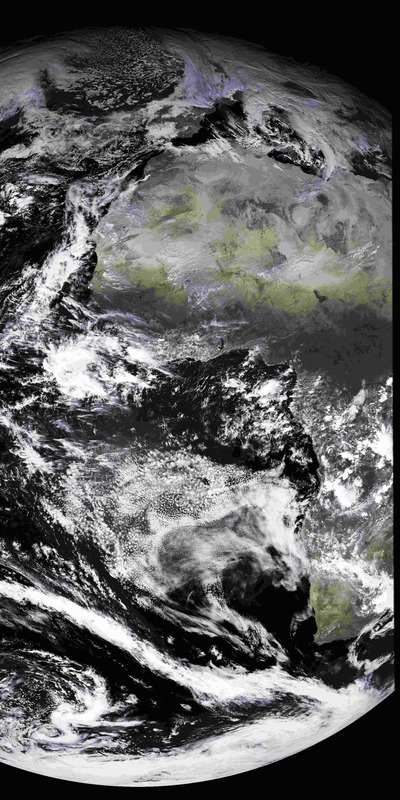 Here is the first published data from MSG-1 processed to false-colour through a experimental version of GeoSatSignal. Please note that this is the full resolution data, not the half-resolution data that has already been published. no - putting in a zip file wouldn't make it any smaller! The data here is a combination of two sensors, the broad-band visible high-resolution channel (HRV) and the far-IR channel centred on 10.8µm. The HRV data is a 3.5MB JPEG image sized at 5568 pixels wide (east-west) and 11136 pixels high (north-south). The thermal data is only one third of that resolution, 3712 pixels square, so it has been interpolated up to to the full HRV resolution. It was a 2MB JPEG. The visible channel has been histogram equalised for better display, although this has made artefacts in the original JPEG image data somewhat more visible. The thermal channel has been used to colour the image, with blue/violet areas being colder, and green areas warmer. This is preliminary data, so there is no spatial or thermal calibration. The resulting image was saved with a higher than usual amount of JPEG compression to keep the file size down. Many thanks to EUMETSAT for making this preliminary data available. As you may know, Eumetsat is now making digital data from Meteosat 7 and Meteosat 5 available directly on the Internet through their new Archive Direct service. Although it is not real-time (data are delayed by 24 hours), it gives the chance for enthusiasts to see some really high-resolution images even if they cannot receive the primary (PDUS) data. The data here was processed through an experimental version of GeoSatSignal which can handle the digital OPEN_MTP format files in which this data is supplied. The file sizes are not too big (2.5MB for IR, 10MB for visible) as a lossless compression is used on the data. The visible channel has been histogram equalised and sharpened and displayed as brightness. The thermal channel has been resampled to the same resolution as the visible channel, converted into temperature, and used to supply the hue of the colour component of the output image. the image was saved with a higher than usual amount of JPEG compression to keep the file size down. You may also be interested in these animations using Rapid Scanning Service data which is broadcast over the same EUMETCast service. 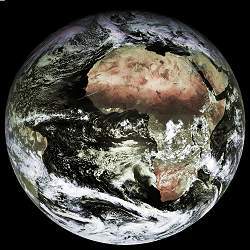 Many thanks to EUMETSAT for providing this new service to users.